Ryan said: "When you have an entire bookstore devoted to children's literature, you can expect a fun experience. Pagony has a giant soft tree in the reading corner with plenty of pillows to curl up with a good book. Books are primarily in Hungarian, but there are English titles too. They also carry children's CDs, DVDs, and some toys. Look for the children's tour guide book in English, Benjamin in Budapest." Budapest is one of the cities which we have visited repeatedly and we are quite familiar with the local bookstore scene which we also described in our Report from Budapest. We were thus very positively surprised to find out that there is a bookstore which we have missed. As Ryan pointed out, it is the specialized children's bookstore Pagony. Pagony was founded in 2001 and it remains the only Hungarian bookstore focusing solely on children's books. 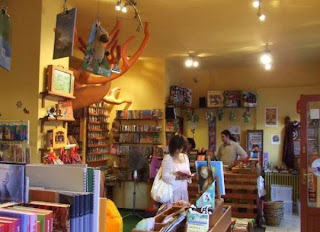 Children's bookstores represent a very specific category among specialized bookstores as the ones who decide their fate are not only those with the cash and credit cards, but to a great extent the kids themselves. And as we all know, kids can be quite unpredictable. However, Pagony offers an environment which the little visitors obviously appreciate very much. The whole stock of Pagony Children's Bookstore, which also includes toys, cartoons and music, is dedicated to the needs and desires of the youngest age group. The main ambition of this bookstore is to inspire a passion for reading and stories at an early age and introduce children to the world of literature. Books in English are not that numerous but you will surely find some titles which will catch the interest of your child. Besides, especially for the youngest ones, it is the visual experience which counts more than the text. Pagony bookstore also organizes all sorts of events related to literature for children such as readings or discussions with the authors.